Tempera and gold on panel. Saint Catherine, who was canonised in 1461 by Pope Pius II, was born in Siena around 1347. Despite the opposition of her family, who wished her to marry and form a family, she entered the Dominican Order as a Tertiary. The saint, who led a life of privation and penitence, dedicated her existence to care of the sick. Among the most frequently depicted episodes in her life are her mystic marriage, her ecstasy and the miracle that took place before the tomb of Saint Agnes, for whom Catherine expressed profound devotion. Among other stories is that of the visit that she paid to Pope Gregory XI in Avignon, during which she persuaded the curia to move back to its traditional residence in Rome. Saint Catherine died in Rome in 1380. This panel is from the predella of an altarpiece that was in the church of Santa Maria della Scala in Siena. According to the abbot Giovanni Girolamo Carli, this ensemble was dismantled and cut up into panels of different sizes for display in different parts of the church in the second half of the 18th century. 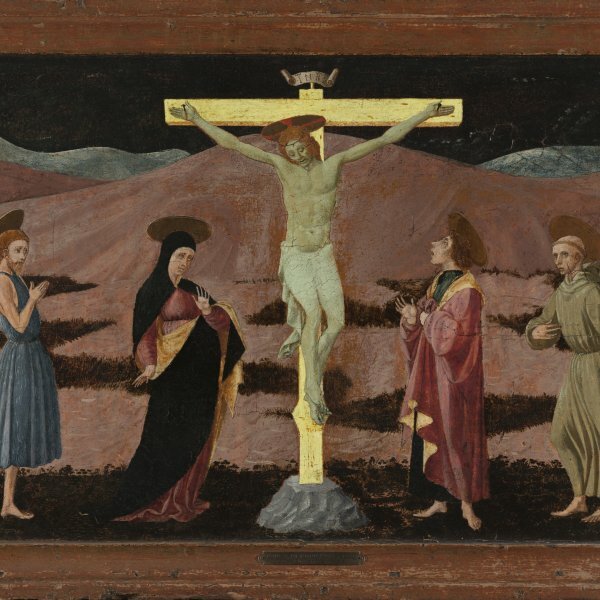 The eleven panels that comprised the predella have been identified in various museums and private collections. They are: Saint Catherine taking the Habit of the Dominican Orderand Saint Catherine and the Beggar in the Cleveland Museum of Art; The Mystic Marriage of Saint Catherine, Saint Catherine exchanging her Heart with that of Christ, and The Death of Saint Catherine, in various private collections; Saint Catherine receiving the Stigmata, Saint Catherine pleading to Christ to revive her Mother, and The Miraculous Communion of Saint Catherine in The Metropolitan Museum of Art, New York; Saint Catherine dictating her Dialogues in the Detroit Institute of Art; and The Crucifixion, which is the central scene in the predella, in the Rijksmuseum in Utrecht. The central panel of the altarpiece, whose predella contained a complex cycle of the life of the saint according to the abbot Carli, was a Presentation in the Temple, which has been identified as a panel in the Pinacoteca in Siena. The altarpiece was commissioned from Giovanni di Paolo in 1447 by the guild of the Pizzicaioli with the intention that it should be finished in 1449. Giovanni di Paolo located the scene in a precise but expressive interior in which the saint and her companion seem overwhelmed by the setting. This impression is conveyed by their small, slender figures in comparison with the size and presence of the members of the curia. The heads are well conceived and the rich decorative motifs that convey the wealth of the papal court at Avignon do not detract from the composition. Despite the ingenious nature of the composition and its construction, the colours and figures create an elegant scene of great force. 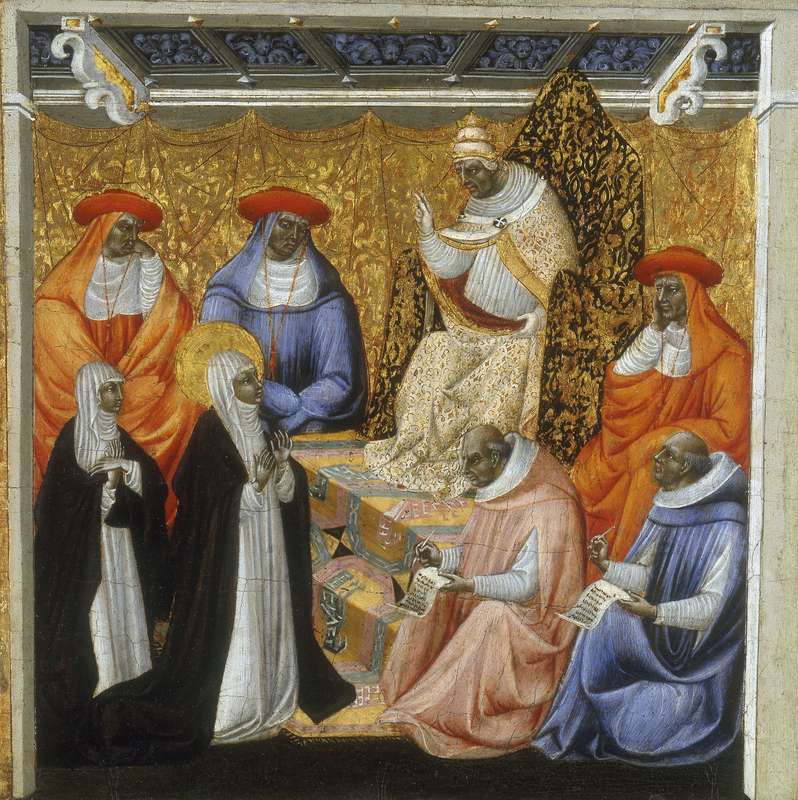 Various reconstructions have been undertaken of the altarpiece in Santa Maria della Scala and it has also been debated as to whether this predella, with its scenes of Saint Catherine, may or may not have belonged to that work, commissioned in 1447 even though Saint Catherine was not canonised until 1461. The present catalogue adheres to the opinion of Boskovits, who considered that the predella was added to the altarpiece later and that its execution roughly coincided with the year this saint was canonised.